Quantitative and qualitative scientific evaluations of the research performance of Thai researchers were carried out with regards to their international publications and citations in four different subject categories; namely Clinical Medicine, Chemistry, Material Sciences, and Engineering. This work used citations to publications of Thai researchers in the Science Citation Index (SCI) database during 1998-2002 as a data source. 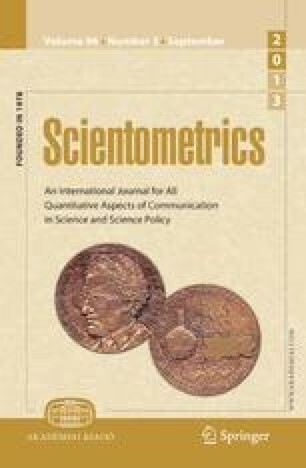 The calculations and comparisons of article impact factors (AIF), position impact factors (PIF) and journal impact factors (JIF) were attempted for quantitative evaluation.The positions and significance levels (cited contents) of the citations were considered for qualitative assessment.For quantitative evaluation, the highest article quantity and number of times cited were given by Thai researchers in Clinical Medicine, the lowest being for Material Sciences. Clinical Medicine had the highest AIF value, while Engineering exhibited the lowest. Each article by Thai researchers was found to be cited more than once within a citing article, especially articles in Clinical Medicine. For qualitative assessment, most articles from Thai scholars were cited in Introduction and Results & Discussion sections of the citing articles. Only non-Thai researchers in Clinical Medicine preferred to use Discussion from Thais' articles for discussion of their work whereas those in Chemistry, Material Sciences and Engineering were referred as general references. Less than 1.5% of research works of Thai scholars were cited as “the pioneer”for the research communities of the subject categories of interest.